It’s the routine of many piano lessons: Teacher sitting next to student sitting at the piano. One copy of the written music. Student and teacher examine it together. 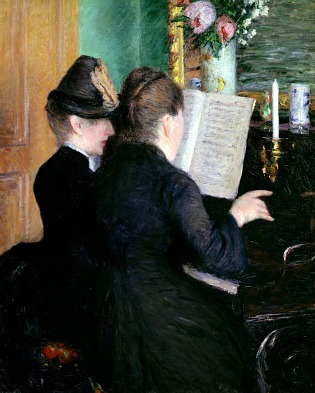 From time to time, teacher reaches over, or deseats student, in order to demonstrate details, or even phrases of the music. (In an unkind moment, I have called it “piano-teacher-position.”) In an alternate version, the teacher occupies a second piano, demonstrating sound, techniques, phrases, or more — that the student repeats back. Let’s not deny teachers provide models. Following from my own teacher Jacob Lateiner, I sit apart from my students, at some distance. I read from a separate copy of the printed music. I aim not to demonstrate on the piano. I do sing notes, intervals, or phrases. When I arrived at New England Conservatory I had the second piano removed from my teaching room. When explanation and singing won’t do it and I succumb to playing during a student’s lesson, it feels like a little failure. Better for the synthesis of ideas and the grappling with issues to lead to sounds arising from within the student, the analysand. Does this represent a new way of thinking or did some of the greatest teachers of the past already have this viewpoint? Hear! Hear! This is the kind of coaching every student needs to be able to make intelligent decisions about interpretation and style and to ultimately continue on and grow as a musician. Wait. I thought teachers were supposed to teach. This all sounds New Agey.